Age I estimate to be 1910-1920. made of oak with glass door panels. The glass made it difficult to capture without reflection. Not too hard to replace. Everything inside is intact to my knowledge(I kept my cotton reels in there). Solid oak. An unusual small piece and in very good condition. As a charity we value our reputation. Small vintage wall cupboard hand painted in Fusion Mineral Paint Homestead Blue colour and clear waxed. Hand finished with antique gold gilding wax. Original key with tassel detail. Shelf painted in pale grey and sealed with crystal clear non yellowing polyurethane. Shabby chic look. Dimensions: Height 43cm Width 45cm Depth 17.5cmTake a look at my other lovely items! 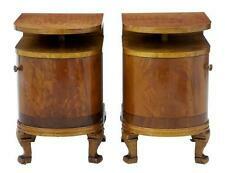 Lovely Pair of Art Deco Walnut Bedside Cabinets Excellent Condition. We have for sale a gorgeous large Arts & Crafts style cabinet with a lift up lid and leaded glass doors. Antique Reclaimed pine corner unit. Antique Reclaimed pine corner unit. 75” Tall 23” wide 16” Deep Collection from Darlington Co Durham. Collection in person only. ALL ORIGINAL, HAND CARVED. A very attractive oak cupboard by MAKEIMPORT CO. that most probably held the radio (look at paper page). The top is hinged and opens. There is only one key for the top set of doors. The cupboard is around 100 years old and shows signs of wear which can be seen in the pictures but generally is in a very good condition. Antique Armoire Wall Medicine Cabinet Solid Oak Miniature Wardrobe with Wall mounting holes. Circa early 20th Century Lovely Hand made early period Arts and Crafts example with ornate Doors and finely carved Plinths. Non working Lock which has a small original Door Handle and Key.. Good condition with some natural fine splits in left Door panel and a small area of blistering on top Panel. Bottles sold seperately if you require them? Dimensions: H: 450 mm (17.5") W: 320 mm (12.5") D: 170 mm (6.5) Buyers can collect I am based near M/cr Airport M22. YEAR OF RELEASE :-1920-40. COUNTRY OF ORIGIN :-ENGLAND/FRANCE. INFORMATION :- GREAT ITEM, AND BECOMING VERY COLLECTABLE. Antique Mahogany Display cabinet. Painted in Water based Black Gloss. Locking Key Present. Lovely art deco cocktail cabinet. But does look beautiful, it is in very good used condition. The key to lock cabinet works. Has a quality feel and look to it. collect from HU12 9RS. With leaded glass display area to the top and storage to the base. Original Old Charm Wood Brothers Linen Fold. cabinet with four doors. Been cleaned and waxed. Width 47.5cm. (Fitted 2 drawers Hand cut Dovetails on cabriole legs, solid Walnut superb Quality. i have the key so you can lock it:) A lot of work as been put in this cabinet. Hand Crafted Hand cut Dovetails good solid condition Quality Made and no woodworm:). A vintage oak court cupboard buffet sideboard priory style cabinet with sliding panels above two door cabinet. Given the age, the cabinet is in good order and ready for immediate use. The top piece is removable for ease of transport. Dimensions: overall height 132cm, depth 50cm, width 123cm Offered in used vintage condition with signs of age, wear and previous use, as might be expected and is mentioned and pictured purely for accuracy. Please see photos for the best description and any marks that should be noted. Click images to enlarge. Delivery: I advertise as local pick-up but appreciate that not all of you live close enough to collect, so if it helps, I can arrange for cheap local delivery (please ask for a quote). Art Nouveau display cabinet (possibly Liberty or Heals). You can see from the photo's that the sides slightly taper going towards the top of the piece which really sets it off. This is a quality piece and has been in my possession for nearly 30 years. This item features A very nice Cabinet with all the classic Yorkshire school features. About Arts & Crafts Yorkshire School. English Oak: The most British of woods, that can produce really special results. Is from the 1930's and typical of the period. With fitted interior and leather writing surface to the fall front which is in good condition. collect in person. A OLD CHARM CANTERED SIDEBOARD. CANTERED DESIGN. MANUFACTURED BY OLD CHARM. NO FANCY BACKGROUND DISPLAY'S OR SOFT PHOTOGRAPHY JUST HONEST CLEAN FURNITURE WITHOUT ALL THE JARGON. DETAILED CARVED FRONT DOOR. A OLD CHARM CANTERED SIDEBOARD. CANTERED DESIGN. MANUFACTURED BY OLD CHARM MODEL No 2198. NO FANCY BACKGROUND DISPLAY'S OR SOFT PHOTOGRAPHY JUST HONEST CLEAN FURNITURE WITHOUT ALL THE JARGON. VERY VERSATILE PIECE OF FURNITURE. THE DRINKS BAR IS PART OF THE VERY POPULAR 'OLD CHARM"LIGHT OAK' RANGE MODEL No.2306 AND IS NOW A VERY RARE FIND. THE DRINKS BAR HAS A SPACIOUS, FIXED TOP, WHICH HAS TRADITIONAL STRAIGHT CUT EDGES AND IT IS AN IDEAL, STURDY SURFACE, FOR POURING DRINKS ETC. 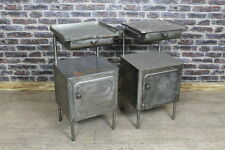 Good Pair Of Bedside Cabinets. In good used condition. A VERY ATTRACTIVE, LATE 20th CENTURY, OAK, OPEN BOOKCASE, OF EXCEPTIONAL QUALITY AND CONDITION. THE BOOKCASE IS PART OF THE VERY POPULAR 'AUTUMN GOLD' K FINISH RANGE, MODEL No. 0526 k. THE BOOKCASE HAS A SPACIOUS FLAT TOP, WITH TRADITIONAL STRAIGHT-CUT EDGES. (Dovetail draw sides and no Woodworm superb Quality redleather top solid oak. lock is missing but easy fix, PLZ NOTE>>now it as a new lock you just got to fit it see pic:). Beautiful piece of furniture. A lovely antique dentist's cabinet. We date this cabinet to the early 20th century. There is a plaque for 'The Martin, premier cabinet co. Sedburgh, Yorks'. The cabinet comprises of various small drawers and cupboards. The cupboards are fitted with locks (key supplied). The drawers and cupboards are fitted with turned wood handles. The top cupboard has lead glass doors and the top surface has a protective glass sheet. The bottom of the drawers also have glass sheet linings. The cabinet has an height of 62" (158cm), a width of 30.5" (78cm) and a depth of 14.5" (37cm). This attractive antique cabinet remains in a good solid condition with surface markings commensurate with age and usage. The very top surface has some very minor marks from past use and the glass in the top cabinet has a crack to one corner edge. Beautiful China cabinet with original keys. May have age related use marks. This is a fabulous Book Case or Bookshelf. A lovely piece from the second half of the 20th. Entry in The Arts and Crafts Style. Fantastic oak Staverton filing cabinet. All the sliding drawers move smoothly. Complete with key to lock the side bar. Depth 27cm. A VERY ATTRACTIVE, LATE 20th CENTURY, SOLID ELM / ASH, HI-FI CABINET, OF EXCEPTIONAL QUALITY AND CONDITION. THE CABINET IS PART OF THE VERY POPULAR 'ERCOL"LIGHT ELM', 'WARWICK' RANGE, MODEL 2071. THE CABINET IS MADE IN THE TRADITIONAL '17th CENTURY STYLE' USING QUALITY SOLID ELM / ASH TIMBER, WITH VISIBLE PEGGED AND STUDDED JOINTS THROUGH-OUT. THIS FABULOUS CABINET IS ENGLISH MADE IN THE TRADITIONAL 'GEORGIAN STYLE', USING ONLY THE VERY BEST QUALITY TIMBER AND FINISHES AVAILABLE. THE DISPLAY CABINET HAS A DECORATIVE TOP CORNICE WITH VERY ATTRACTIVE 'TEAR-DROP' MOULDINGS BELOW. ANTIQUE VINTAGE wooden DISPLAY CABINET CUPBOARD SIDEBOARD. A VERY ATTRACTIVE, LATE 20th CENTURY, 'BREAKFRONT', CARVED OAK, CORNER T.V. CABINET / STAND, OF EXCEPTIONAL QUALITY AND CONDITION. THE CABINET IS MADE IN THE TRADITIONAL 'GEORGIAN STYLE' USING THE BEST QUALITY OAK TIMBER, VENEERS AND FINISHES AVAILABLE. A VERY ATTRACTIVE, EARLY 21st CENTURY, SOLID ELM, CORNER T.V CABINET, OF EXCEPTIONAL QUALITY AND CONDITION. THE CABINET IS PART OF THE VERY POPULAR 'ERCOL', 'LIGHT ELM', 'WINDSOR RANGE', MODEL No.2120. A VERY ATTRACTIVE, LATE 20th CENTURY, SOLID ELM / ASH, DRESSER / DISPLAY CABINET, OF EXCEPTIONAL QUALITY AND CONDITION. THE CABINET IS PART OF THE VERY POPULAR 'ERCOL', 'GOLDEN DAWN', 'WINDSOR RANGE', MODEL No.2013 & No.2149. A VERY ATTRACTIVE, LATE 20th CENTURY, CARVED OAK, HI-FI CABINET, OF EXCEPTIONAL QUALITY AND CONDITION. THE CABINET IS PART OF THE VERY POPULAR 'OLD CHARM', 'TUDOR BROWN' RANGE, MODEL No.2439. THE HI-FI CABINET HAS A SPACIOUS, FIXED, SQUARE TOP, WITH ROUNDED CORNERS AND TRADITIONAL STRAIGHT-CUT EDGES. This Arts & Crafts influenced sliding door display cabinet on stand was made by a student of Edward Barnsley between 1957 and 1963. Simply scroll down the page to view them. Handmade solid oak bookcase by Alan 'Acornman' Grainger of Acorn Industries with sliding glass doors and 'Mondrian' style shelving. The style of this bookcase is very modern and minimal and would suit a variety of interior styles. The cabinet is beautifully simple and handmade in a country style with rustic and artisan carving and it features decorative period door hinges complete with a charming and characterful squeak! The crocheted shelf trim and carving are a lovely original features and add to the charm of this cabinet. A VERY ATTRACTIVE, EARLY 21st CENTURY, CARVED OAK, TALL RECESSED SIDEBOARD / DISPLAY CABINET, OF EXCEPTIONAL QUALITY AND CONDITION. THE SIDEBOARD IS PART OF THE VERY POPULAR 'OLD CHARM"LIGHT OAK' RANGE, MODEL No.OC 2730. Ideal for wall mounted or table top display and storage. 46cm highest point, 26.5cm wide and 17cm deep.